Bob Armstrong opened his diner in December 1935 in the midst of the Depression. 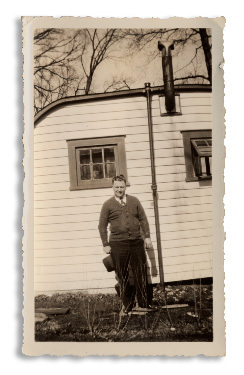 He started small – just a 14 X 41 foot building with seating for 36. The new diner, according to local press of that time, was “well-equipped with six booths, a new fountain, a coffee urn, steam tables, and two electric refrigerators.” Bob employed his mother as the cook and kept the establishment open 24 hours, 7 days a week. “Never closed,” the sign on front said. His risk paid off, as the response to his Main Street business was outstanding. In fact, within a few weeks, he expanded the size of the kitchen to accommodate the crowds. Customers enjoyed the interior “brown-stained plywood” and the experience of watching the cook prepare their food within sight. “Mr and Mrs armstrong have established an enviable reputation for good cooking. They appear to know what people like to eat and how to prepare it for them.” (Bainbridge Republican, Dec. 12, 1935). The exterior of the building was an inviting white paint with green trim while window boxes were added in the summer. It didn’t take long for Bob’s Diner to become a welcome landmark in the Bainbridge community and a place for local residents and travelers to gather for meals and good conversation. 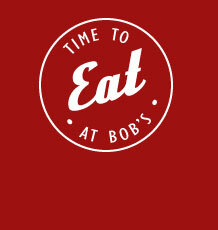 Bob’s continues to be a landmark in Bainbridge, thanks to the work of present owner John Payne who purchased the diner in 1994, remodeled it, and expanded it to include a bigger kitchen and meeting room in the back, while maintaining that vintage 1950s diner feel. Now the diner is well-positioned to meet the needs of today’s customers looking for a diner experience with good food and a clean and comfortable atmosphere.